Clicking on images or highlighted text will link to content within the website. Pages are set to load at 1024x768, but may be made larger by dragging them out. Alluvium, the Latin word describing the contents of an alluvial deposit  clays, gems and precious metals  would appear to be an appropriate name for this confluence of contemporary ceramics and metals practice. Trudy will be exhibiting new works in this international group show to be held at The Macau Museum of Art this summer. "Bidirectional fabrication for ceramic artists"
Trudy will be presenting her current research on bidirectional fabrication for ceramic artists at The Australian Ceramics Triennale Tasmania in Hobart this spring. 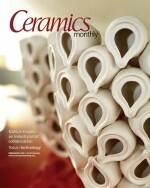 Paul's article published in the Summer/Fall issue of Studio Potter magazine.